Millions of people fantasize about leaving their old lives behind, enrolling in cooking school, and training to become a chef. But for those who make the decision, the difference between the dream and reality can be gigantic — especially at the top cooking school in the country. For the first time in the Culinary Institute of America’s history, a memoir gives readers the firsthand experience of being a full-time student facing all of the challenges of the legendary course in its entirety. On the eve of his 38th birthday and after shuffling through a series of unsatisfying jobs, Jonathan Dixon enrolled in the CIA (on a scholarship) to pursue his passion for cooking. In Beaten, Seared, and Sauced, he tells hilarious and harrowing stories of life at the CIA as he and his classmates navigate the institution’s many rules and customs under the watchful and critical eyes of their instructors. Each part of the curriculum is covered, from knife skills and stock making to the high-pressure cooking tests and the daunting wine course (the undoing of many a student). Dixon also details his externship in the kitchen of Danny Meyer’s Tabla, giving readers a look into the inner workings of a celebrated New York City restaurant. With the benefit of his age to give perspective to his experience, Dixon delivers a gripping day-to-day chronicle of his transformation from amateur to professional. 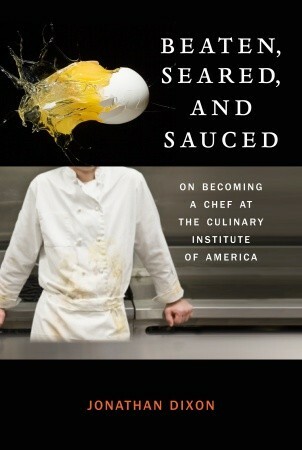 From the daily tongue-lashings in class to learning the ropes — fast — at a top NYC kitchen, Beaten, Seared, and Sauced is a fascinating and intimate first-person view of one of America’s most famous culinary institutions and one of the world’s most coveted jobs.